Welcome to the Made in the USA Giveaways Link-Up. 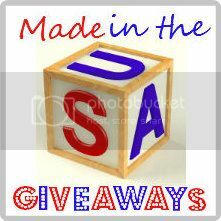 This link-up creates more opportunities for you to find products that are made in the USA and, possibly win something. If you are hosting a giveaway and your product is made in the USA, you are invited to list your giveaway here. To all of you that have linked up items here, thank you. 2. Multiple-item giveaway? All of the items must be made in the USA. 3. Gift cards or cash? Go right ahead and list those here. Submit Giveaway as: Title / End Date. Example: Beauty Product 05/30. ***** Please make sure you list an end date. Otherwise, your giveaway could be removed before it ends. Thank you. Please make sure that your giveaway is for a product that is Made in the USA. You're welcome and thank you for stopping by and leaving a comment. That was very kind of you.